Tackling Rugby: Not-so-Super Rugby format? Welcome to the latest edition of Tackling Rugby - our regular feature that will debate the key issues in the game. With the Aviva Premiership's leading clubs missing out on the Heineken Cup crown once again, we ask whether English rugby's top flight should increase their salary cap. What do you think? Be sure to join the debate on our Facebook page. The best England had to offer fell woefully short in both the Heineken Cup and Amlin Challenge Cup this term. Yes there were moments of brilliance with Harlequins defeating Toulouse in France and Gloucester beating the same opponent at Kingsholm, but no English representation in the final four of either competition paints a dim picture. While it is reckless and perhaps guilty of burying ones head in the sand to purely put this down to the salary cap, the restrictions placed on English sides is definitely having some bearing on their form in Europe. The cap is currently levelled at just over £4m while teams in France have the luxury of going up in excess of £7m. From next season the level will rise to £4.25m with clubs having the room to bring in a marquee player outside of the cap. But English rugby is still in the dark ages. The world's best players are turning out in France week in week out while in Ireland the relative freedom the province's have financially means their players are at the peak of their fitness for the key matches. It is not coincidence that there were two Irish teams contesting the final of the Heineken Cup and two French teams in the Amlin Challenge Cup with no English clubs in sight. The Premiership is already feeling the effects of the cap both directly and indirectly. Directly speaking - players such as Horacio Agulla will leave the Tigers this summer due to the new Rugby Championship structure and the league will be worse off for it. His coach Richard Cockerill put the decision to allow Agulla to leave down to the salary cap. As Japan becomes ever more tempting with the embarrassment of riches on display, figures such as Alesana Tuilagi are also on the next plane out of Heathrow. "To also state that the league would be separated into the 'haves' and 'have-nots' if the cap was abolished or raised significantly is woefully unfair on the likes of the Exeter Chiefs." Indirectly, teams are missing out on recruiting the world's top talent. Bath went big for Dan Carter last year but cap restrictions put paid to any chance of this coming to fruition. Imagine a league with the likes of Carter going up against Tuilagi. It would generate more interest in the southern hemisphere and the clubs would benefit from higher level of sponsorship as the league becomes ever more desirable. To also state that the league would be separated into the 'haves' and 'have-nots' if the cap was abolished or raised significantly is woefully unfair on the likes of the Exeter Chiefs. They have already contested against Europe's best this season and will go into the Heineken Cup next season set to cause the giants some headaches. It is a team forged on unity, hard work and dogged enthusiasm regardless of whether they are spending up to the £4.25m on offer. Even if the cap was raised further, this would not change - Exeter would still cause the best sides in the league problems. 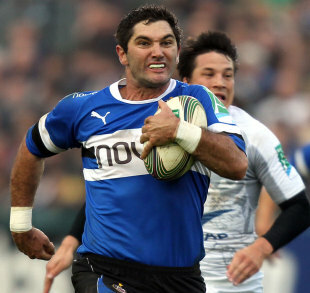 I am not suggesting clubs should start paying up to the levels on offer in Japan - with Jaque Fourie widely reported to be the highest paid player in the world - but a rise in cap would create a better product, improve English sides chances of conquering Europe and the younger players would also develop from working alongside some of the world's best. A debate on the merits of the salary cap stretches far beyond balance sheets to the very fabric of the game. Granting the Aviva Premiership clubs the freedom to splash the cash may attract the world's best players to English rugby's top flight may sound appealing on the face of it but not if it jeopardises the very existence of those clubs in question. I don't care if you are Dan Carter, Richie McCaw or Sonny Bill Williams - no player is worth that gamble. In case you missed it at the weekend, Premiership Rugby were delighting in the fact that four of the Premiership's 12 clubs are now making a profit. Yes, just four. And as far as those clubs are concerned - Northampton, Exeter, Gloucester and Leicester - we are not talking lottery-sized numbers. To put things in perspective, Manchester City's Carlos Tevez earns as much in a month as the Saints were able to call profit at the end of last season. "The allowance for a 'marquee signing' was a great innovation and should allow the marketing men and women to make hay without giving the accountants a major headache." The picture may be improving but even the Premiership's most successful clubs are on a precarious financial footing and great care must be taken to ensure the good work being done in a testing economic climate is not undone. London Wasps, not long ago the kings of Europe, recently sailed perilously close to administration in a stark reminder of the current picture. The pressure to go toe-to-toe with the big-spending sides in France's Top 14 and the Union-backed Irish provinces is already stretching the leading Premiership clubs to the limit. An alarming 89.5% of Saracens' turnover for the year ending June 2011 went on staff costs - that strikes you as a very dangerous ratio even if you are one of the country's leading sides. The allowance for a 'marquee signing' was a great innovation and should allow the marketing men and women to make hay without giving the accountants a major headache. The Premiership remains a fascinating battle thanks in part to the constraints of the salary cap. Those clubs whose turnstiles sing to the tune of 10,000 for a home game may well wish for the ability to spend that revenue on more players but that would open up a significant void between those who struggle to attract those kind of numbers and who do not even spend their salary cap allowance at present. The current structure also encourages and rewards the development of home grown talent that should also benefit the game as a whole in the long run. Nothing will put bums on seats like English-qualified talent going toe-to-toe on a weekly basis.